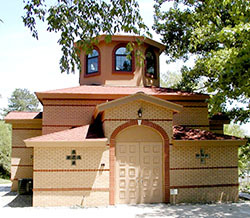 Saint George Greek Orthodox Chapel is located on the grounds of Holy Trinity Greek Orthodox Cemetery, 8941 Ringeisen Road, Allison Park, PA. The Chapel is used for funerals, interments, Saturday of the Souls Memorial Services, the annual Saint George Feast Day and most weekday services. Work on the sacred iconography of the Chapel commenced in the Spring of 2008 and is being done by Florin Vlad, an accomplished Byzantine iconographer of Romanian descent and training. Photos of the construction and iconography of the Chapel can be found online at the Holy Trinity Online Photo Gallery: photos.HolyTrinityPgh.org. The Chapel is the fruit of many years of desires of the Holy Trinity community to provide a place of sacred worship at Holy Trinity Cemetery and to appropriately honor the founders and beloved reposed members of the parish. Its construction was made possible through years of memorial offerings as well as major bequests and gifts from Holy Trinity parishioners. The building is the work of Christ J. Kamages AIA (Concept Design), William J. Fiedler RA (Final Design) and Thomas Mitrakos (Builder). The official Groundbreaking and Laying of the Foundation Service for the Saint George Chapel was held on Saturday, April 23, 2005, on the feast days of Saint George the Great Martyr and Trophybearer and the Saturday of Lazarus with His Eminence Metropolitan Maximos presiding. The building phase was completed in October 2005. The first Saturday of the Souls Divine Liturgy and Memorial was held on Saturday, February 25, 2006 and the official “Opening of the Doors” service was held on Monday, April 24, 2006, the Feast of Saint George the Great Martyr and Bright Monday, again with His Eminence Metropolitan Maximos presiding. In March, 2009, the Saint George Chapel was pressed into additional community service when the heating at Holy Trinity Church went out of service and required weeks of repairs and renovations. The Chapel provided a wonderful home for the Lenten services during March and April, enhanced greatly by the newly-completed dome iconography with scenes from the Second Coming and Resurrection.